I must have been three years old. I think it was the first time I ever saw snow or something like that, and I ran outside in my pajamas and started running in the snow. That’s actually really delightful. Would you say that reflects your day-to-day character? Are you joyful all the time, running into new situations with excitement? I think I’m always interested in running into the snow. I’m always interested in running into whatever. “What is this thing over here? What is this? Let’s try this out.” And a lot of the times I’m not always prepared for it. I’m just in my pajamas, and I probably should have done more homework. When you were 10 years old, what did you see yourself doing as an adult? Having a beard. I didn’t really know. I still cannot grow one, so that’s never gonna happen. I think I wanted to be a Nintendo programmer at that point and a professional basketball player shortly after that. In fifth grade I had to fill out a “what do you want to be when you grow up?” [questionnaire], and I wrote on this thing, “stand-up comedian”. Years after I went away from that, and then eventually came back to it. But I always loved comedy. I didn’t understand why people weren’t watching comedy all the time. What got you started with Second City and doing improv in general? When I moved to Chicago I’d go up and do five minutes, and I realized that a lot of the same people were there the following week. This is how I know all those guys: Hannibal [Buress], and Kumail [Nanjiani], and Pete Holmes, and [Kyle] Kinane, and a million other people that are just super awesome and influential. I felt I couldn’t do the same material in front of all those guys as I just did the week before. You’ve got to know your audience. If your audience knows your material, there’s nothing in it for them. And I’m talking about The Lion’s Den, the one specific show every Monday night. I felt I could use every other open mic and every other show the rest of the week to work on material, but for that Monday night show I tried to do five new minutes every week. And I did that for years. Then I got hired on a cruise ship and I was gone for four months, so for the first time since I started comedy I didn’t write five new minutes every week because I didn’t have an outlet to perform them. I started moving and traveling more, and then I started focusing my writing on more scripts, sketches and working on various other projects. Some weeks are just more than others, how motivated can you get that particular week. But I feel rhythm is like the biggest thing. It was because I was in a rhythm of writing five new minutes every week, that’s why that happened. Once you break that rhythm, it’s really hard to get that momentum going again. In 2011 you won the Andy Kaufman Award. It’s my understanding that those who win the award get to spend five nights with Andy at his mansion in Bavaria, where he has been living in secret for all these years. What was that like? It’s great. You get to go to Bavaria, but you never get to actually meet Andy. He’s always wearing a completely full blue body suit, and he’s generally underwater the whole time. I had dinner with him as he sat in the aquarium at the far end of the table. We had lunch while he was at the bottom of the swimming pool—he’s got some sort of oxygen device. Do you think he’s actually alive still? Did you read about Bob Zmuda and his new book? It’s more fun to believe that he is. It’s more fun to believe in Santa Claus than to not. If he’s alive, I think this is the year that he reveals himself and he comes out and he tells everybody that he was Bob Zmuda the whole time. Let’s transition to some sports talk. How do you think ISIS will do over these next few months, and how will they affect the other global players? I get that they’re in a building year, this year. They’re in a transition year. I think they’re more into—I don’t know. They don’t have their priorities correct, you know? To be perfectly honest, their uniforms are garbage. They’re not very good for running around in and kicking and throwing and jumping and running. They’re very restraining. They’re gonna get caught on a lot of things, and I just think they really need to rethink their entire uniform if they want to have a chance to get any sort of athletic achievement. Do you think there will ever be an event that ushers in an era of peace or even a gradual transition to global tranquility, or will we always be hungry for war? Do you have any major aspirations unrelated to comedy or entertainment? In one year I saw Bill Cosby and Dave Chappelle. I saw them within a month of each other, and they both got heckled. It’s like, “Wow, it never ends.” I think at one point, you’re just like, “I should go to Africa and dig wells. I should try to fix the homeless situation in at least one city and give people the medicine they need.” I think I have an odd-wired brain, and if it was wired one way different, I’d be the homeless guy trying to play cards with pigeons on the corner. There’s a pill that guy can take that will make him think normal again. To me I almost feel like that’s more rewarding than the low points of comedy. Also: Professional space-jumper. If I could just jump from space into Earth and get paid for that some how, that could definitely be dope. If money were no limitation, what would you be doing right now? I would just guess space-jumping. Space-jumping, yeah. I wanna get paid for that. I would only do it if I get paid, you know? I’d probably spend more time with my family, as lame is that sounds. I’d fly them out more; I’d fly home more often. It’s unfortunate that money is a factor to that. I think rocket-pack around Tokyo. I would love to build a giant Godzilla, and then I’d love to rocket-pack defeat him and then just be a hero. I think more outlandish, month-long pranks where no one really knows what happened. More alien sightings, Bigfoot sightings. I just want to mess with everybody’s minds. I think that would be very entertaining. I wanna save homeless people. I want to help out those who are unfortunate. And those that are fortunate, I want to take down. With pranks. What things in life give you the most pleasure? I’m a sucker for people being good to each other. Like, any video where strangers are good to each other, I’ll sort of get tiny choked up, you know? I’ve just lost so much faith in humanity that when I see it, it’s just a great reminder. Pinball is my huge thing right now. I’m a pinball addict. There’s a Walking Dead and Great Lebowski pinball machine coming out soon that I’m super excited about. I don’t know if anybody is as excited about it as I am, and I don’t have a lot of people I can talk to about it. There’s something about pinball that just fits with my personality. People are often like, “But you don’t have any control over it.” No, you’re wrong. It’s sort of like chaotic darts. It’s chaos, but you can sort of control the chaos a little bit. You have some say in the chaos. At the end of the day, there are just things that are beyond your control, and it’s just how you adapt. Part of me just loves the idea that everything is just ridiculous and crazy and completely bonkers, and you have some control over it, and, Jesus, when three multi-balls are going on, it’s just bonkers-town. With the internet you can now have more control of your career by “gaining a following” and all that stuff. I feel like we as comedians, we do a lot of things that we feel are necessary or they’re part of the “do everything we can to make this possible career work.” I feel like a lot of the things that we feel are necessary are actually a distraction. Sometimes I sit there and go, “If I took all the time I’ve spent on writing blogs and podcasts and Twitter and my web page and all that stuff, never spent one second on any of that stuff, how many screenplays would I have done by now?” It’s hard to step back and look at Twitter and be like, “I did a real good Twitter feed.” Even if I don’t sell it, I think I’d have more sense of accomplishment of writing something that’s meaningful, that I think is good work. You have been given one week left to live. What do you do with your time? After mild anticipation following our announcement two weeks ago, issue 12 of The Annual (the first of our final four) is now available in our web store! It’s a very limited run with only about 20 copies remaining, so get yours before they’re gone! This issue features our interviews with Rich Fulcher and Nick Vatterott as well as the truth about what really happened to Andy Kaufman. Learn about black superheroes and what The Virgin Mary really looked like shortly after giving birth to Jesus. Purchase your copy today to have quality laughs shipped straight to your mailbox! We’ve been on a bit of a hiatus lately with irregular updates, postings and quarterly magazines. Luckily we were putting the hiatus to good use by preparing our first of four final print issues. That’s right, final. It’s not financially feasible for us to constantly tear down a small forest to produce print editions of The Annual. We are prepared to produce years of comedy for your eyes to consume, but we want to close out the print chapter on our own terms and that begins here and now. 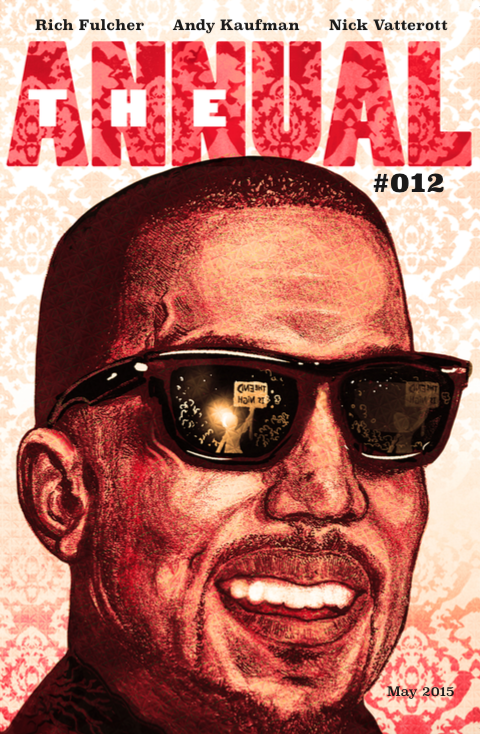 We’ve ordered a very limited run of The Annual #12, on May 15th copies will be shipped out to subscribers and on May 17th copies will be available to attendees at The Last Hurrah, and the remaining issues will be sold on our web store starting Monday May 18th. You won’t want to miss this issue, it’s got interviews with Rich Fulcher, Nick Vatterott and an in depth look into what really happened to Andy Kaufman. Not to mention, lost invites from the Secret Service and an examination of Black Superheroes (or the lack thereof). There are great things on the horizon, with regular original content returning this Monday, because The Annual will always be here to provide humor more than once a year.